Just kidding. We are off on our adventures, but I'm committed to having some random, and here I am. Consistent as the mail, that's me! So far we've seen tons of fields of dead corn plants on our drive. All I can say is, do we really need to plant this much corn? I mean, we are in a drought, wouldn't it make sense to maybe plant something more drought tolerant? Corn uses up a ton of water. We passed this house on the way to Glen Rose. I am sure that it is at least a hundred years old, but it sure is an eye catcher. And it's for lease! I would love to own an old house like that, but it would have to be fixed up by someone else, because I am not allowed to handle power tools ever. It's a sordid story. I also wouldn't want to live on what passes for Main street. Maybe they could move it to a pleasant hill somewhere? Speaking of streets, Texas has streets, but there's also Ranch Roads, and Farm to Market Roads, and County Roads, and Highways, and Interstates, and Loops. Does anyone else have weird road labels in their state? Oh, and Tollways. Texas has a system where you just drive on the tollway and they send you a bill later. It's a bit more expensive, but at least you don't have to slow down. It was totally worth it NOT to have to drive through Austin, which is a black hole when it comes to random traffic jams. 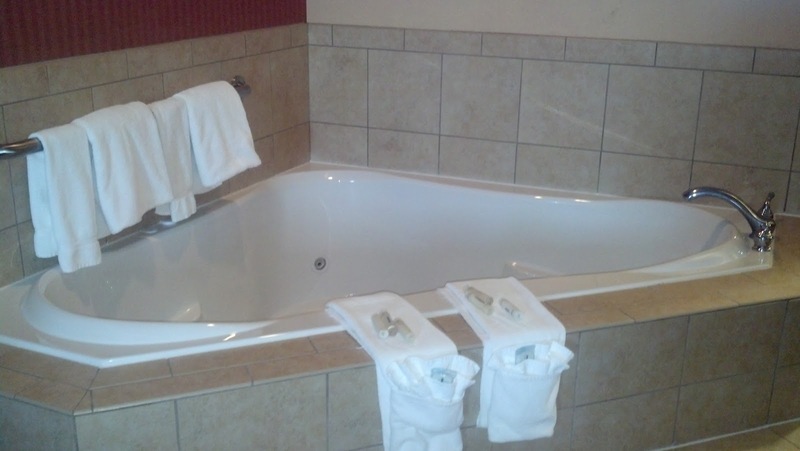 This monstrosity is in our hotel room here in Glen Rose. Apparently we got the Big Daddy Suite at the Holiday Inn Express. Not that my son minded--that is a swimming pool in his eyes. We plopped him in there each night while we were unwinding, and he had a blast in his own private pool. Of all the places we have stayed over the years, the Holiday Inn Express has been the most consistently pleasant. The folks here in Glen Rose have said hello to us each time we've come in, and they've been very helpful in pointing us in the right directions when we've been lost. Plus, they've been so nice to my son, who isn't exactly a quiet child. Customer service is a huge thing for me, and a smile never hurts anybody. I have to laugh at the politicians who are on these commercials talking about how 'they' will single-handedly repeal 'Obamacare' if they are elected. As if they'll just waltz into the Congress and lay down the law. Geez. Talk about being ignorant of the process. Republicans and Democrats don't have to like each other, but they certainly have to work together. The art of politics is compromise, and while being recalcitrant might get you noticed, it definitely does not set a good example for children. Look at the most successful Senators and Congresspeople--the ones who have been there longer than a session or two. They didn't get there by throwing tantrums and refusing to cooperate with people on the other side of the table. Right now I'm embarrassed for my child to see all the extremist behaviors showing up in the political arena. Instead of a What Not To Wear show, there needs to be a How Not To Behave in Public show. My parents are taking care of the cats while we are away. I put out plenty of food and water for Pounce, since she never comes downstairs. Zena is in and out all the time, so she's the one they will have to watch for, but she can take care of herself, judging by all the snakes and other critters she has brought home. My dad will put out some food on the patio and make sure the water bowls are full, and that will have to do until we get back. Should I have mentioned the Mama skunk and her twins to my dad? 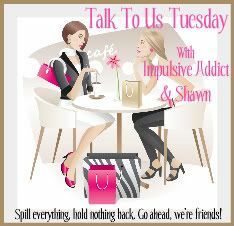 I'm hooking up with Stacy over at Stacy Uncorked and also with the wonderful ladies(Shawn and Impulsive Addict) over at Talk To Us Tuesday. Both of these places are great for finding fun blogs, so go check them out! We're road-tripping in December, adding Holiday Inn Express to our list of possibilities! Happy Tuesday! We take off week after next. Tis the time of summer travel--hope you are having fun on your trip! I love summer, sleeping late, beaches and vacations! We've stayed at HI Express with softball and you're right, they are always very nice, customer Service goes a long way with me! Thanks for linking up with us and I would tell your Dad about the skunk unless you're ok with Zena smelling like one when you get home. I love that house ... but I agree it would have to be moved to somewhere green with lots of big trees and NOT on the main road. 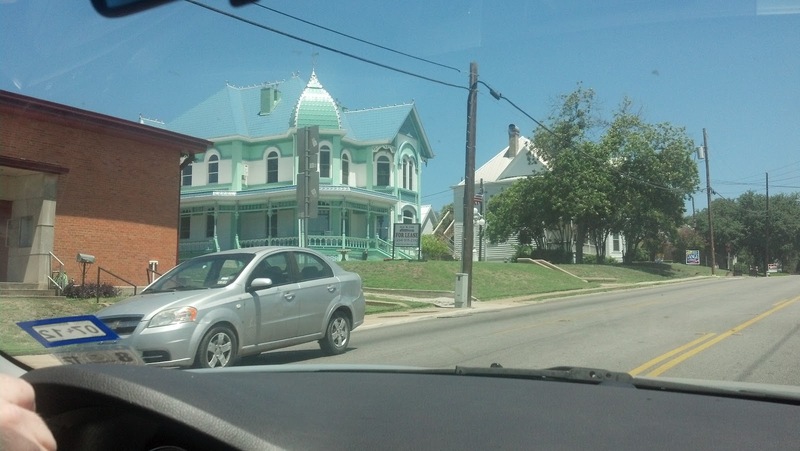 That house is incredible, but I want to see the inside! Do you think I can talk your dad into coming to Oklahoma and tending to my cats while I go on a vacay?? No. It was worth a shot. There's a house that I have always loved. You could only see it when you were looking for it through all the over grown bushes. Turns out it's from 1797, and the town is restoring it... a museum on the first floor, office space on the second, and two condos on the top floor. OH what I wouldn't give to live in one of the fully restored condos! As far as the politicians... I just love that Romney is one that's saying it's unconstitutional, yet he mandated it here while HE was Governor. And for what it's worth, our taxes didn't go crazy and EVERY child has access to doctors and dentists.